Sitting aside Kings Park Stadium and near the iconic Moses Mabhida Stadium, Durban’s Lion Match Factory holds its own as one of the warm city’s memorable architectural landmarks. Property development and construction group, JT Ross, bought the 90-year-old site more than 10 years ago when Lion Match moved its manufacturing operations to Gauteng. 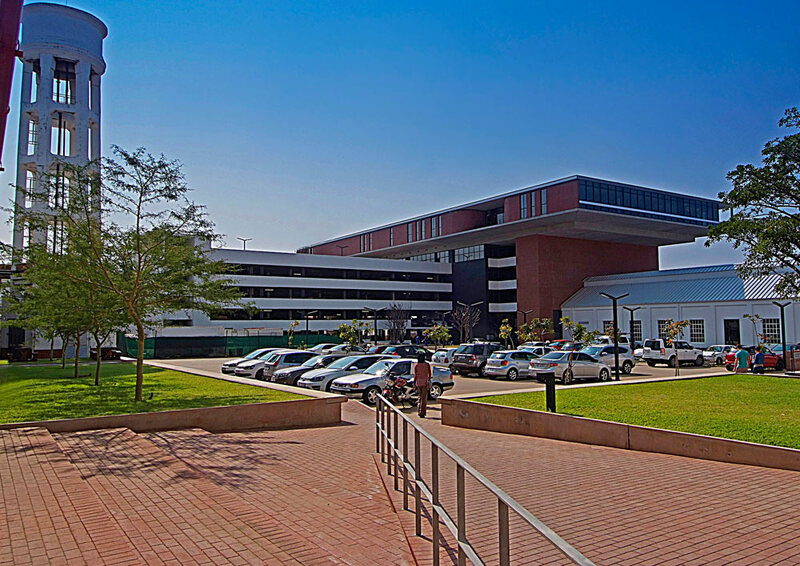 Rejuvenation of the site, which is situated on Durban’s inner city fringe, began under the guidance of Dean Jay Architects, one of the many tenants based at the premises. Listed as an Amafa heritage site, construction of the new buildings and refurbishment of the existing buildings was carefully monitored with the architects opting to blend the old and new buildings seamlessly yet with pertinent distinguishing features. Sarah Fourie of Dean Jay Architects, said the bricks used in the refurbishment were a mixture of reused old bricks from one of the demolished warehouses, alongside Corobrik’s range of terracotta satin face bricks and burgundy pavers. Allin Dangers, Director of Coastal Sales for Corobrik, said it was rewarding for Corobrik to have its products involved in redefining the spaces of this beautiful Durban landmark. Brick is deep in the fabric of this building and to see it being re-expressed and incorporated in different ways to enhance context and the buildings aesthetic is a real pleasure. He said the terracotta satin face bricks were the perfect choice to blend with the older bricks and the variation in brickwork pattern gave character and charm to the individual buildings. The interiors of the existing buildings have retained the industrial, factory design with exposed trusses and clerestorey lighting. The internal face brick has been painted in shades of white and grey which introduces different textures while staying in keeping with the industrial feel. The older buildings have also retained the original English bond brickwork pattern on the plinth which correlates with a number of the signature building aspects such as the “signage walls” which have been constructed using reused old bricks. “We wanted to sustain what we could from the old structures but have made the style quite obvious in the newer structures,” explained Fourie. This is evident when walking towards the trendy Boiler Room cafe, housed in the original factory boiler room which has a much more modern feel. This sits alongside the eye-catching chimney stack which has retained its original brickwork yet blends in with the newer structures. One of the newer buildings is the impressive six-storey building on the eastern side of the property, which comprises a parkade and office block, the top level of which houses the offices of JT Ross. The southern side of this has an immense 18m high face brick wall which proved to be a significant design challenge for the architects. Corobrik’s terracotta satin face bricks were the perfect choice, effortlessly blending the feel of the older buildings with a more modern look. The design selected for the wall was English bond brickwork with a relief pattern whereby every second half-brick protrudes from the wall by 15mm. The 15mm projection was the correct decision with an impressive overall effect. “The projecting bricks create different shadows throughout the day so the look of the wall is forever changing. It never looks the same as the day progresses,” said Fourie. The inevitable efflorescence – a white, salt deposit from the face brick – is disguised by the pattern of the bricks. This is carefully juxtaposed with the sixth level, which cantilevers over the lower levels. The perimeter wall of the sixth floor office level is constructed using a Corobrik face brick in a stack bond. For the paving, Dean Jay Architects selected Corobrik’s range of Burgundy pavers, used in a Herringbone pattern for the heavy vehicular traffic flow, and a stretcher bond pattern for the pedestrian traffic.